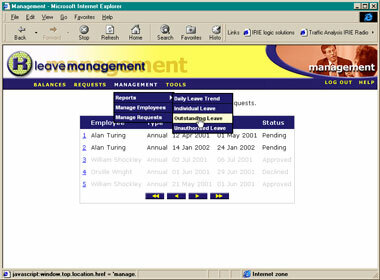 Leave Manager is an Intranet application designed to completely manage the staff member leave entitlement process form request to approval with minimum bandwidth requirements. The application is an ideal candidate for widely spread corporate offices allowing central management and reporting while allowing business group managers to control their own teams requirements. The process is initiated with the staff member exploring their leave entitlement using the real-time “Balances Calculator”. Current entitlements of all leave types are shown with the ability to select a date in the future from the integrated calendar picker in a “what if” scenario. This process calculates what leave would have accrued by the selected date incorporating currently approved leave. Once selected the user can submit the request with colour coded status indicators. At this point the manager can review all requests submitted by team members with automatic confirmation of minimum staffing levels. A one click approve/decline process for each request can be administered quickly and efficiently with a full historical record of all responses maintained for easy access. A manager can also initiate requests for team members and approve/decline them in a single one step process, ideal for staff without Intranet access. A “front desk” facility is available to log company wide telephoned-in sick leave requests with full search and locate facilities on staff member names. The system incorporates comprehensive “interactive” reporting capabilities with inbuilt Microsoft Active-X graphing capabilities. Streamlined integration is attained due to the real-time NT domain user and password authentication. 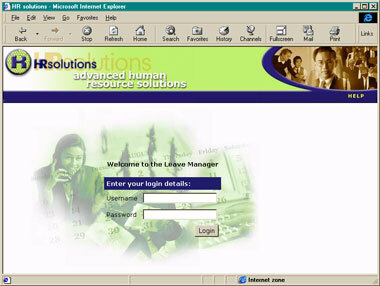 Once staff members have been assigned to their respective group hierarchy, then standard network login/password combinations are used to access Leave Manager functions. All password changes within Leave Manager are also reflected at a company domain level for the users next network login.